 My season so far has gone well, I'm lucky enough to have some lovely horses to ride and produce! They have all stepped up a level this year and have done it pretty much seamlessly. Edyvanta and Ellfield Voyager have moved to up to 2* level, with placings and double clears and making it feel very easy! Chakiris Star has moved up to CCI3* level, completing Bramham and Haras du Pin finishing in the top 20 of both and is now being aimed at Pau CCI4* which is very exciting! The younger horses have all been very consistent but the star has been the 5yo Wisbeach Cevin'z Pride. He won the 5yo class at Nunney from start to finish on his dressage score of 18.5 and his heading to the finals at Osberton. He is also heading to the BYEH final at Burghley on Friday! The help from Mark at the beginning of the season really set us off in the right direction, lets hope the season ends as well. When it was announced that I had won the MTBTG scholarship, I couldn't quite believe it as this was a fantastic opportunity to receive help and support from one of the best riders in the world! I've had 2 training sessions with Sir Mark so far and both times I've taken 3 horses. All 3 horses are very different and Mark was fantastic at spotting and solving little problems I've had with each of them. I've come away from both training days feeling the horses and I have really improved during the sessions. I've also received some fantastic kit - bridles, rugs, boots and lots more - from The Mark Todd Collection, which is really helping us to look smart. My aims for this year with my top 2 horses (Chakiris Star & Colby) are to get their CCI3* qualifications at Bramham and Haras du Pin and, if all goes well, to then finish at Pau CCI4*, which will be the horses and my first 4*. With the help of Sir Mark Todd, the support of The Mark Todd Collection and KeyFlow Feeds, I'm sure the 2017 season is going to be great! Alexander Whewall was this week announced as the 2016/17 winner of the Mark Todd Bridging the Gap Scholarship. The 28 year old full time event rider impressed judges Sir Mark Todd, Gill Watson and Lizzel Winter to secure the training and support package after what has been a successful season for the Bristol based competitor. Winner of the prestigious Smith & Williamson Intermediate Championship this year on Miss Lisa Coward’s 10 year old gelding Chakiris Star, Whewall has also notched up 10 top 20 placings at international competitions in 2016, including 10th place at the St. James’s Place Barbury International Horse Trials CIC3*. Alicia Hawker, 22 from Wiltshire, and Kent’s Rose Carnegie, 26, took second and third spots respectively, receiving BE training vouchers, while all finalists were kindly presented with a rug, jacket and saddlepad from The Mark Todd Collection. "I can't tell you how excited I was to win the MTBTG Scholarship. Mark is a rider I've always enormously admired, as most riders do, both because of his talent as a rider and a horseman and also because he started out doing it the hard way, with minimal support and on horses he produced from scratch himself. This is something that I can wholeheartedly relate to in my career so far. His success has been built on determination, hard work and love of the sport, which is such an inspiration for me. To have Mark's influence and support over the coming year will be invaluable and I feel so lucky to be benefiting from it." "I had such an educational day having my first training sessions with Mark and it was so good of him to come down to me and spend the day. During the sessions we worked hard on both my riding and the horses' way of going; his eye for finer detail made such a difference. I came away from it with lots to continue working on with each individual horse and I already feel I will be going into this coming season with a far better knowledge of the little things that will make a big difference to the end result." The winner of the 2015/16 Mark Todd Bridging the Gap (MTBTG) Scholarship has been announced by the judges following the final selection day yesterday (28th September). The six finalists gathered at a private venue in Wiltshire where they were put through their paces in the saddle by Sir Mark Todd and lead MTBTG Coaches, Lizzel Winter and Gill Watson, before being interviewed by representatives from The Mark Todd Collection and Keyflow Feeds. The unanimous winner was Tim Cheffings who is 32 years old and from Tiverton in Devon - pictured above with Mark Todd. The two runners up were Mary Edmundson and Sam Dempsey. Tim follows in the footsteps of former Scholarship winners Franky Reid-Warrilow and Zoe Wilkinson in this, its third year. 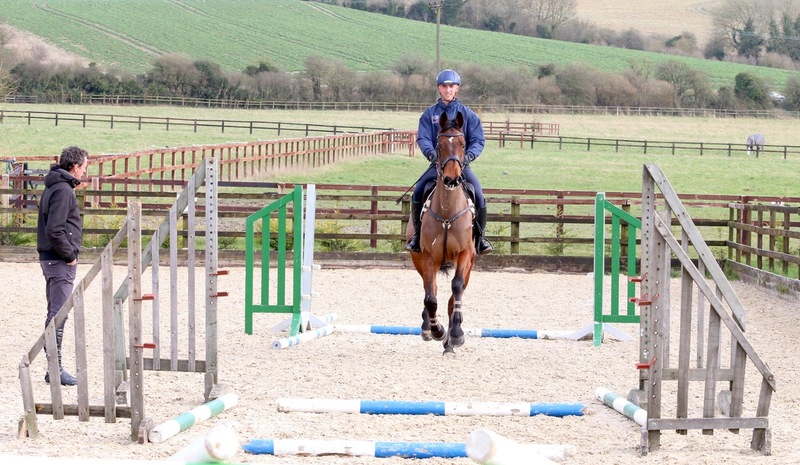 In addition to running a string of horses ranging from up and coming youngsters through to several horses now at 3* level, Tim is also a UKCC Level 2 Eventing Coach. Mark Todd commented: "Firstly, I would like to say thank you to Gill and Lizzel who do such a fantastic job of Coaching all riders on the Bridging the Gap training days, and also to British Eventing for organising the scheme. "We all need to have training and, although it takes time and money, you have to make that effort if you want to improve. Unfortunately we could only pick one winner today but I must congratulate all of our finalists. They really impressed us with the way they have performed and conducted themselves, both in the ridden and interview situations." This exclusive scholarship is part of the MTBTG programme and sponsored by The Mark Todd Collection and Keyflow Feeds. The course and scholarship have been specifically designed to support event riders aiming to move into Advanced/2* as well as those working to a more established 3* level. 1. Three individual training sessions, plus mentoring, from Sir Mark Todd. The second placed rider will receive £250 worth of Keyflow Feed and all finalists were presented with a rug, jacket and saddlepad from The Mark Todd Collection, along with a bag of Keyflow feed. 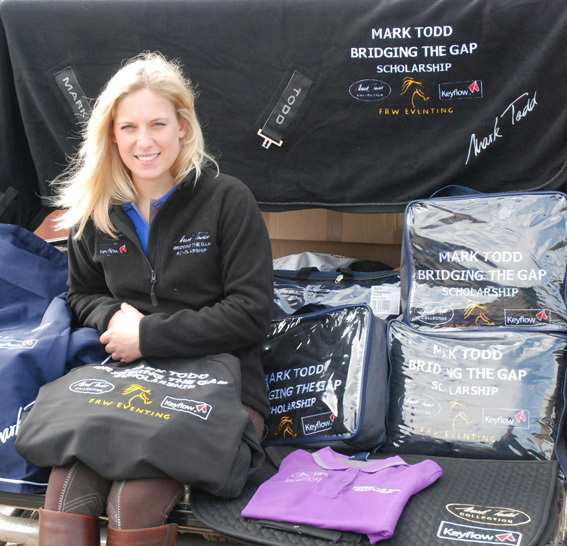 Entries are now open for the Mark Todd Bridging the Gap Scholarship which will see one lucky event rider win training and mentoring from Sir Mark Todd, plus £3,000 worth of product sponsorship from the Mark Todd Collection and Keyflow Feeds; a scholarship package that will run throughout 2016. The competition is open to riders that have attended at least one of the Mark Todd Bridging the Gap (MTBTG) ridden training sessions that British Eventing are running throughout the 2015 season. The initiative provides training opportunities for riders aiming to move into Advanced or 2* competition, or who are working towards a more established 3* level. The brainchild of renowned BE Coach, Gill Watson MBE FBHS, the MTBTG training programme (which also includes free course walks at key events) has become hugely popular since its launch in 2013 to the extent that, where possible, Gill and fellow coach, Lizzel Winter FBHS, run extra days to accommodate numbers. Mark Todd’s involvement came along with title sponsorship from his branded products: the Mark Todd Collection and Keyflow Feeds Previous MTBTG Scholars include Franky Reid-Warrilow, who has made the step up to 3* and notched up a couple of notable 2* wins, and last year’s winner, Zoe Wilkinson, who aims to complete her first 3* this season. Further information on the Mark Todd Bridging the Gap Training Scheme can be found in the training section of the British Eventing website, while entries can be submitted via keyflowfeeds.com/mtbtgIt’s been an exciting time for Zoe Wilkinson since she won the Mark Todd Bridging the Gap Scholarship at the end of the 2014 eventing season. 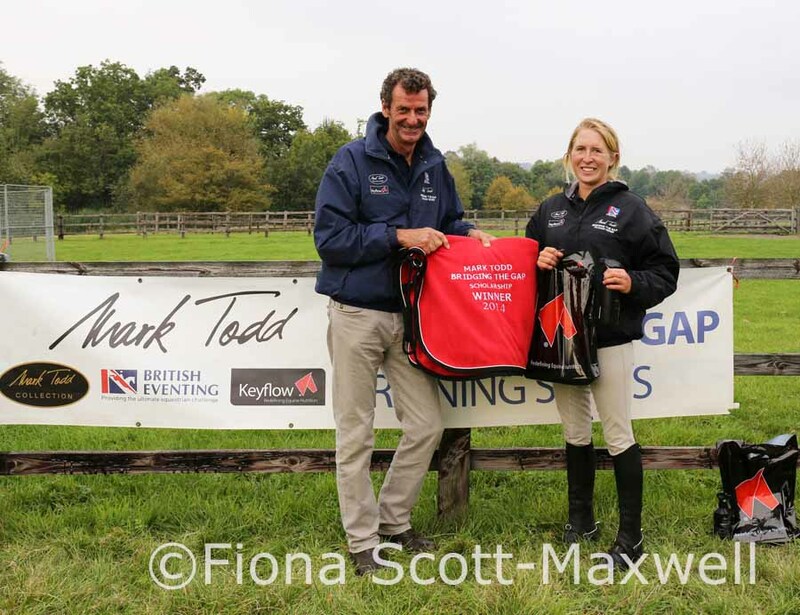 As well as moving into an amazing new yard, courtesy of Parkfield Breeding, she has been supplied with products from The Mark Todd Collection and Keyflow Feeds who sponsor British Eventing’s MTBTG Training Series. Zoe has also been for the first of her training sessions with Sir Mark at Badgerstown, as well as getting the chance to walk the course with him at Badminton. “GHS Calvaruise, my top horse, has been stepping up at Advanced level with mixed results. He went very well at Weston Park but was a little disappointing at Withington Manor where he had a couple of stops on the cross-country. We had a few sessions cross-country schooling and then had a successful first CCI** run at Houghton. It wasn't the best he could have performed but he was solid in all three phases and ran comfortably at that level in his first three day event. The plan is to step up to CIC*** in the second half of the season and then compete in another three day at either 2* or 3* level. 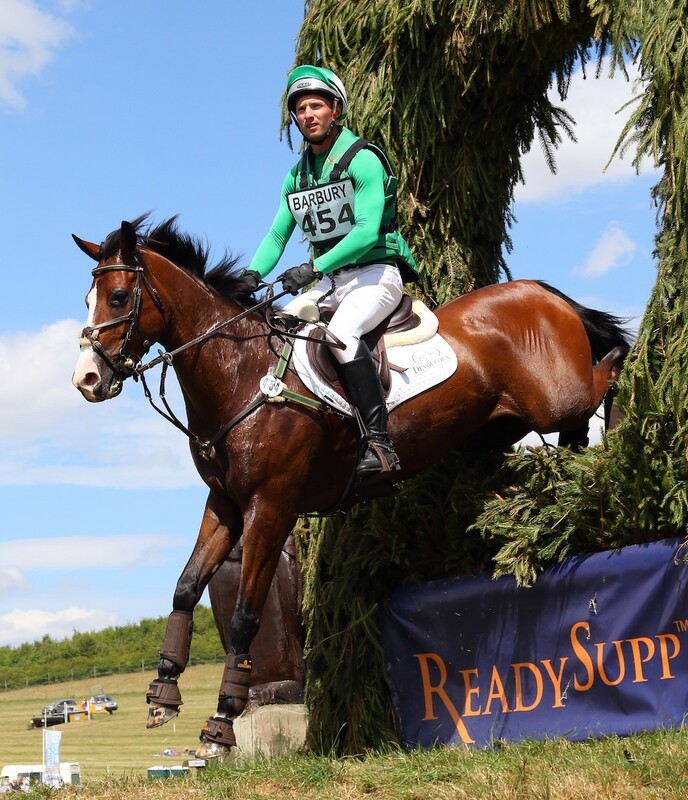 “Parkfield Quintessential, owned by Parkfield Breeding, made a very successful step up to 2* level with his first CIC** run at Rockingham Castle where he finished 2nd. He is currently on track for his big aim this year, which is to return to Le Lion d'Angers in October for the 7 year old World Championships. Following the final selection day on the 29th September, the winner of the 2014/15 Mark Todd Bridging the Gap (MTBTG) Scholarship is 24 year old Zoe Wilkinson. Oxfordshire-based Zoe was chosen by the judging panel made up of Sir Mark Todd, British Eventing Accredited Coaches Lizzel Winter and Gill Watson, and representatives from BTG sponsors, Keyflow Feeds and the Mark Todd Collection. A former head girl and yard rider for Paul Tapner, Zoe began eventing when just 14 years old with an ex-racehorse that she retrained herself. The co-founder of E.Z. Equestrian in 2011, Zoe has gone on to have great success producing young horses, winning the Burghley Young Event Horse Finals in 2012 and 2013 with Parkfield Quintessential. Her top horse, GHS Calvaruise, was sadly injured from mid 2012 to mid 2013 but this year has become very competitive at Intermediate level, and has just completed his first Advanced. Zoe now intends to establish him at Advanced level, and if all goes to plan, next year aim for Bramham Under 25’s or the Blenheim Palace CCI3*. Zoe commented on her win: "I am so surprised as I'd been watching everyone ride and the standard was really high. To be mentored by Mark Todd is an amazing opportunity; every part of the scholarship will be important to me. Getting feed and advice from Keyflow and products from the Mark Todd Collection will all prove invaluable." Seven finalists went forward for the final selection day and all had an anxious wait while the judges deliberated over their decision. Sir Mark said afterwards: "The standard today was extremely high which made the selection process exceptionally difficult but after much deliberation Zoe was a unanimous choice. There is no doubt in my mind that the Bridging the Gap Training Series is really paying off for those that use it." Zoe will receive a significant support package for the 2015 competition season including three individual training sessions and mentoring from Sir Mark. She also wins £1500 worth of Keyflow Feed plus nutritional advice, as well as clothing, tack and horse wear from the Mark Todd Collection, also to the value of £1500. 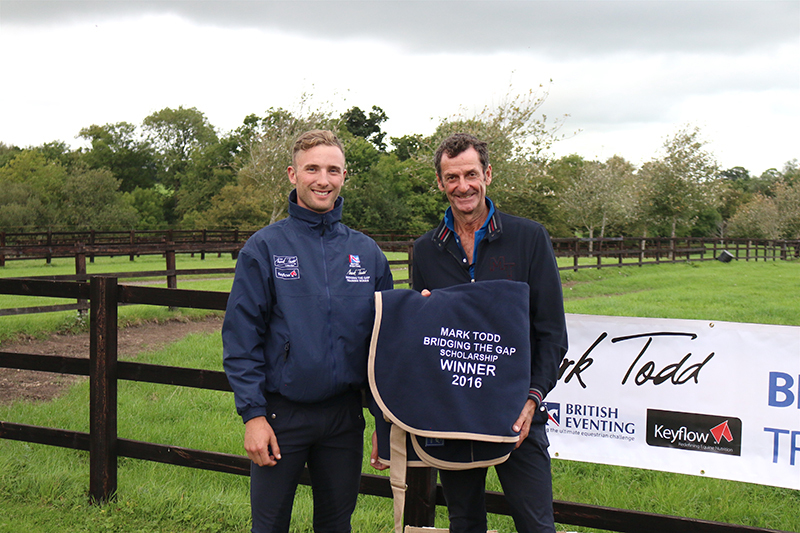 Second and third placed riders Kat Raybould and Tyler Cassells received BE training vouchers whilst all finalists were presented with a rug, jacket and saddlepad from the Mark Todd Collection and will receive feed and nutritional advice from Keyflow. As the competition season draws to a close, last year's winner, Franky Reid Warrilow, updates us on her year as the first Mark Todd Bridging the Gap Scholar. We are very close to the end of the season which always makes me a little sad, but it is always a good time to look back and see how far each horse has come and to assess how my business is progressing and what else needs to be done over the winter to keep it going. Being and event rider is very much like living in a dream or sometimes a nightmare. It is quite a strange existence when you compare it to other ‘normal’ people who work Monday to Friday, 9-5, go out for a drink on a Friday night and then either spend the weekend socialising with their friends or relaxing, getting ready for the same thing the following Monday. In October I turn 25 (I can’t believe how quickly that has come around) and I have been competing horses since I was 13, so for me it is normal to have a limited social life, work every single day and continuously miss out on parties either because I am too busy, too tired or too skint. This year in particular lots of people have questioned whether I get lonely and whether I mind ‘missing’ out; my answer has always been the same – no, not really. Being an event rider is not just about loving and competing horses, it is a way of life, much like being a farmer. An event rider is an athlete the same as a marathon runner, footballer or cyclist (sadly we don’t get paid as much) and I doubt many of these sportspeople get to have every weekend off socialising with their friends and only work 9-5. That is how I see it, I have chosen this way of life and I have chosen to be an athlete, the compromise of missing out on a few parties is nothing to me, especially when I get to do what I love every single day. The only down fall is the salary! On the competing side of things I have had a good year. My yard is currently full of some fantastic young horses which I am producing to sell and my top horse Dolley Whisper has had a great year at 3*. Barbury Castle was our first one and what a fantastic event that is. The atmosphere got to the both of us a little in the dressage (where I went wrong and we made a few other mistakes) and the show jumping where I froze for the first few fences and we had an uncharacteristic one down. But she stormed around the tough XC taking all of the direct routes and when I got over the finish line I was on such a high! Finally I had done a 3*. Before Barbury I had another training session with the one and only Sir Mark where we practiced XC, so his help and guidance was much appreciated and helped me feel that much more confident to tackle 3*. After Barbury I went to Hartpury where we got a PB dressage test of 46.2 leaving us in equal 15th over night and behind mostly WEG horses, so I was very happy. There is still SO much room for improvement and I would like to think that by next year we could be 10 marks better. Mark helped me to walk the course and this time I stepped up the pace. We had an incredible round, much improved from Barbury although on paper it doesn’t read that. I did have a glance off at the second water but as far as Whisper knew she didn’t do anything wrong. I took her on such an acute line she never even saw it so it wasn’t really a run out, more of a canter alongside and past! In shock and showing my inexperience I brought her on a silly line the second time and didn’t get it together so we ended up with 60 which was a shame. When I actually presented her to the fence on the right line and in the correct control she flew it-rider error!!! I was very annoyed with myself because without that we surely would have been top 10! I am now taking Whisper to Belgium at the end of September to do another CIC3* which should get us our qualification for a CCI3* next year. The younger horses have finished their season and 5yo Primitive Popeye waited until his last event to get it all together and finish on his fantastic dressage score of 21.5 to win. I have struggled a bit with his SJ but this proves that patience is the key with young horses! The horses have been incredibly spoilt this year because they have been fully kitted out in gear from the Mark Todd Collection and they have really looked the part! They all wear the Mark Todd Performance bridle which I absolutely love. It has all of the little details that I like, such as a cut away head piece, no crank on the noseband and it is adjustable on both sides. During the summer they have travelled to events in their matching Fleece Mesh Coolers and when it’s a bit colder they wear the Fleece rug. Both of these rugs are not only smart but they work very well allowing the horse to breathe whilst keeping them warm and looking incredibly smart, they are very spoilt! They also have matching Mark Todd blue nylon head collars just to top it off! I have also been spoilt but sadly I have now used up my quota having ordered so many different types of products which shows just what an extensive range the Mark Todd Collection has. I have got some Moana fleeces, Venus and Contender Breeches, the new blue and purple t-shirts, a competition shirt, bling belt and matching spur straps, leather competition gloves, a beautiful pair of Riley Boots which I wear every day and so many other things! The closing date for this year’s Mark Todd Bridging the Gap Series is just around the corner and whoever wins doesn’t know how lucky they will be! It’s a shame I can’t apply again, this has been such a boost for me in so many ways and I am truly grateful to all of those involved. British Eventing for putting on the series, together will Gill and Lizzel, all of the people at the Mark Todd Collection and Keyflow and of course to Mark for taking me on and being such a help! I hope next year’s winner gets as much out of it as I have and best of luck (although I will be slightly jealous).